Albany, NY - The New York State Tourism Industry Association (NYSTIA) has recognized leaders in New York State's tourism industry who have achieved a high level of excellence and accomplishment at the 2016 Tourism Excellence Awards. The winning individuals or organizations are selected on the basis of demonstrated commitment, leadership, and accomplishment in travel and tourism. Meg Vanek, Chair of the Awards Committee for the New York State Tourism Industry Association acknowledged the winning programs stating, “The Tourism Industry is a major economic development driver across New York State. We are proud to honor even just a handful of those who have helped to make this leading industry thrive. Including Governor Andrew Cuomo among this year's honorees is our organization's way of acknowledging his commitment to continue strengthening our industry in this great state." NYSTIA President and CEO, Jill Delaney, adds, “Tourism is the fourth largest employer in the State of New York. The strength of our industry comes from the creativity, passion and commitment of those leading the way with innovative ideas. NYSTIA proudly recognizes the accomplishments of our industry leaders with the goal of inspiring creativity and passion throughout New York State's tourism industry." 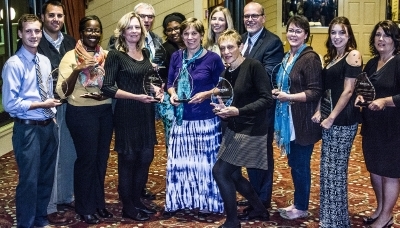 2016 Winners were honored with trophies, sponsored by AAA Publications, at the NYSTIA Tourism Excellence Awards Dinner on Thursday, October 20, 2016 at The Villa Roma Resort in Callicoon, NY; Sullivan County. Advance Media NY provided a reception for the honorees and attendees, followed by dinner, hosted by Meredith Travel Marketing. New York State Tourism Industry Association honoring excellence and achievement in New York State's Tourism Industry. The New York State Tourism Industry Association (www.nystia.org) is a statewide membership based organization for travel and tourism related businesses. NYSTIA is a 501c6, New York State not-for-profit Corporation engaged in the business of advocacy, leadership, marketing and professional development. Photo credit: "Rich Klein New York Photography."